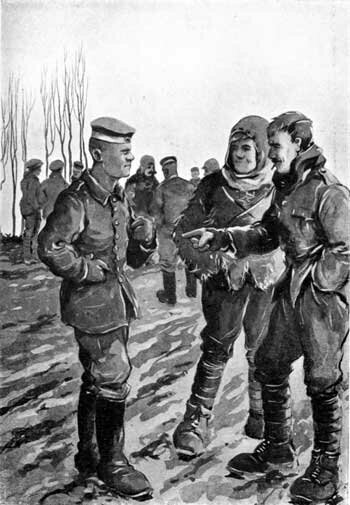 Bruce Bairnsfather (left) photographed on Christmas Day 1914 - and the Christmas Truce he drew later that same day, showing the scene where he wants the buttons of the German officer. Below you will find an eyewitness account of one of those memorable Christmas Truces that took place on the Western Front on Christmas 1914. 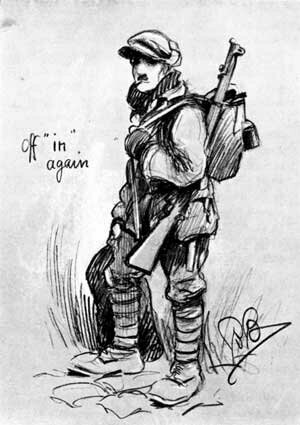 It was written bij Second Lieutenant Bruce Bairnsfather, who became famous for his war-drawings. We went "in" again on the 23rd. The weather had now become very fine and cold. The dawn of the 24th brought a perfectly still, cold, frosty day. The spirit of Christmas began to permeate us all; we tried to plot ways and means of making the next day, Christmas, different in some way to others. Invitations from one dug-out to another for sundry meals were beginning to circulate. Christmas Eve was, in the way of weather, everything that Christmas Eve should be. I was billed to appear at a dug-out about a quarter of a mile to the left that evening to have rather a special thing in trench dinners—not quite so much bully and Maconochie about as usual. A bottle of red wine and a medley of tinned things from home deputized in their absence. The day had been entirely free from shelling, and somehow we all felt that the Boches, too, wanted to be quiet. There was a kind of an invisible, intangible feeling extending across the frozen swamp between the two lines, which said "This is Christmas Eve for both of us—something in common." "You can 'ear 'em quite plain, sir!" "The Germans over there, sir; 'ear 'em singin' and playin' on a band or somethin'." I listened;—away out across the field, among the dark shadows beyond, I could hear the murmur of voices, and an occasional burst of some unintelligible song would come floating out on the frosty air. The singing seemed to be loudest and most distinct a bit to our right. I popped into my dug-out and found the platoon commander. "Do you hear the Boches kicking up that racket over there?" I said. "Yes," he replied; "they've been at it some time!" "Come on," said I, "let's go along the trench to the hedge there on the right—that's the nearest point to them, over there." So we stumbled along our now hard, frosted ditch, and scrambling up on to the bank above, strode across the field to our next bit of trench on the right. Everyone was listening. An improvised Boche band was playing a precarious version of "Deutschland, Deutschland, uber Alles," at the conclusion of which, some of our mouth-organ experts retaliated with snatches of ragtime songs and imitations of the German tune. Suddenly we heard a confused shouting from the other side. We all stopped to listen. The shout came again. A voice in the darkness shouted in English, with a strong German accent, "Come over here!" A ripple of mirth swept along our trench, followed by a rude outburst of mouth organs and laughter. Presently, in a lull, one of our sergeants repeated the request, "Come over here!" "You come half-way—I come half-way," floated out of the darkness. "Come on, then!" shouted the sergeant. "I'm coming along the hedge!" "Ah! but there are two of you," came back the voice from the other side. Presently, the sergeant returned. He had with him a few German cigars and cigarettes which he had exchanged for a couple of Maconochie's and a tin of Capstan, which he had taken with him. The séance was over, but it had given just the requisite touch to our Christmas Eve—something a little human and out of the ordinary routine. After months of vindictive sniping and shelling, this little episode came as an invigorating tonic, and a welcome relief to the daily monotony of antagonism. It did not lessen our ardour or determination; but just put a little human punctuation mark in our lives of cold and humid hate. Just on the right day, too — Christmas Eve! But, as a curious episode, this was nothing in comparison to our experience on the following day. On Christmas morning I awoke very early, and emerged from my dug-out into the trench. It was a perfect day. A beautiful, cloudless blue sky. The ground hard and white, fading off towards the wood in a thin low-lying mist. It was such a day as is invariably depicted by artists on Christmas cards—the ideal Christmas Day of fiction. "Fancy all this hate, war, and discomfort on a day like this!" I thought to myself. The whole spirit of Christmas seemed to be there, so much so that I remember thinking, "This indescribable something in the air, this Peace and Goodwill feeling, surely will have some effect on the situation here to-day!" And I wasn't far wrong; it did around us, anyway, and I have always been so glad to think of my luck in, firstly, being actually in the trenches on Christmas Day, and, secondly, being on the spot where quite a unique little episode took place. Everything looked merry and bright that morning—the discomforts seemed to be less, somehow; they seemed to have epitomized themselves in intense, frosty cold. It was just the sort of day for Peace to be declared. It would have made such a good finale. I should like to have suddenly heard an immense siren blowing. Everybody to stop and say, "What was that?" Siren blowing again: appearance of a small figure running across the frozen mud waving something. He gets closer—a telegraph boy with a wire! He hands it to me. With trembling fingers I open it: "War off, return home.—George, R.I." Cheers! But no, it was a nice, fine day, that was all. Walking about the trench a little later, discussing the curious affair of the night before, we suddenly became aware of the fact that we were seeing a lot of evidences of Germans. Heads were bobbing about and showing over their parapet in a most reckless way, and, as we looked, this phenomenon became more and more pronounced. A complete Boche figure suddenly appeared on the parapet, and looked about itself. This complaint became infectious. It didn't take "Our Bert" long to be up on the skyline (it is one long grind to ever keep him off it). This was the signal for more Boche anatomy to be disclosed, and this was replied to by all our Alf's and Bill's, until, in less time than it takes to tell, half a dozen or so of each of the belligerents were outside their trenches and were advancing towards each other in no-man's land. I clambered up and over our parapet, and moved out across the field to look. Clad in a muddy suit of khaki and wearing a sheepskin coat and Balaclava helmet, I joined the throng about half-way across to the German trenches. This was my first real sight of them at close quarters. Here they were—the actual, practical soldiers of the German army. There was not an atom of hate on either side that day; and yet, on our side, not for a moment was the will to war and the will to beat them relaxed. It was just like the interval between the rounds in a friendly boxing match. The difference in type between our men and theirs was very marked. There was no contrasting the spirit of the two parties. 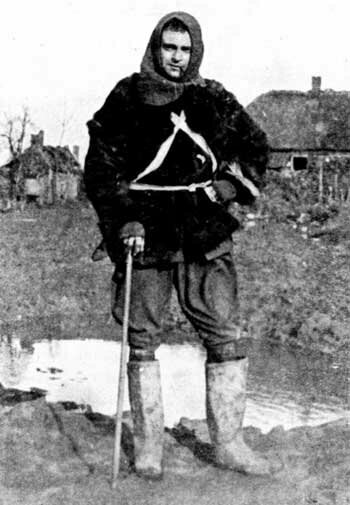 Our men, in their scratch costumes of dirty, muddy khaki, with their various assorted headdresses of woollen helmets, mufflers and battered hats, were a light-hearted, open, humorous collection as opposed to the sombre demeanour and stolid appearance of the Huns in their grey-green faded uniforms, top boots, and pork-pie hats. The shortest effect I can give of the impression I had was that our men, superior, broadminded, more frank, and lovable beings, were regarding these faded, unimaginative products of perverted kulture as a set of objectionable but amusing lunatics whose heads had got to be eventually smacked. "Look at that one over there, Bill," our Bert would say, as he pointed out some particularly curious member of the party. I strolled about amongst them all, and sucked in as many impressions as I could. Two or three of the Boches seemed to be particularly interested in me, and after they had walked round me once or twice with sullen curiosity stamped on their faces, one came up and said "Offizier?" I nodded my head, which means "Yes" in most languages, and, besides, I can't talk German. We both then said things to each other which neither understood, and agreed to do a swap. I brought out my wire clippers and, with a few deft snips, removed a couple of his buttons and put them in my pocket. I then gave him two of mine in exchange. Suddenly, one of the Boches ran back to his trench and presently reappeared with a large camera. I posed in a mixed group for several photographs, and have ever since wished I had fixed up some arrangement for getting a copy. No doubt framed editions of this photograph are reposing on some Hun mantelpieces, showing clearly and unmistakably to admiring strafers how a group of perfidious English surrendered unconditionally on Christmas Day to the brave Deutschers. Slowly the meeting began to disperse; a sort of feeling that the authorities on both sides were not very enthusiastic about this fraternizing seemed to creep across the gathering. We parted, but there was a distinct and friendly understanding that Christmas Day would be left to finish in tranquillity. 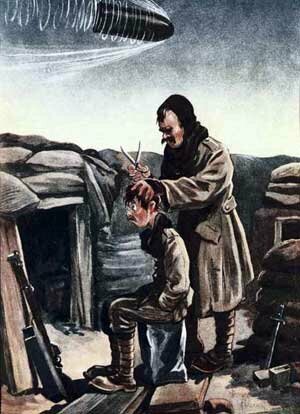 The last I saw of this little affair was a vision of one of my machine gunners, who was a bit of an amateur hairdresser in civil life, cutting the unnaturally long hair of a docile Boche, who was patiently kneeling on the ground whilst the automatic clippers crept up the back of his neck. Read also: Demystifying the Christmas Truces of 1914 and 1915, by Thomas Löwer. The last known survivor of the Christmas Truce died in November 2005. Read here what Alfred Anderson told a year before he died.